Celery is a biennial vegetable, meaning it grows in a cycle of once every two years. While commonly thought of as light green, in Europe celery is often white. Today’s celery developed from a wild variety, native to the Mediterranean region. Dating as far back as the 9th century B.C.E., celery leaves were used for medicinal properties and to decorate athletes in Ancient Greece. The use of celery as a food grew in Europe in the 1700’s. Celery is an excellent source of vitamin C and fiber. Celery also contains potassium, folic acid, vitamins B6, B2, B1, and calcium. One celery stock only contains 20 calories. Celery contains phytochemical compounds called coumarins, which are shown to help prevent cancer by enhancing the activity of white blood cells. Coumarin compounds in celery also aid the vascular system, lower blood pressure and help ease migraines. Celery juice can act as an electrolyte due to its high levels of potassium and sodium, and can also help lower cholesterol. 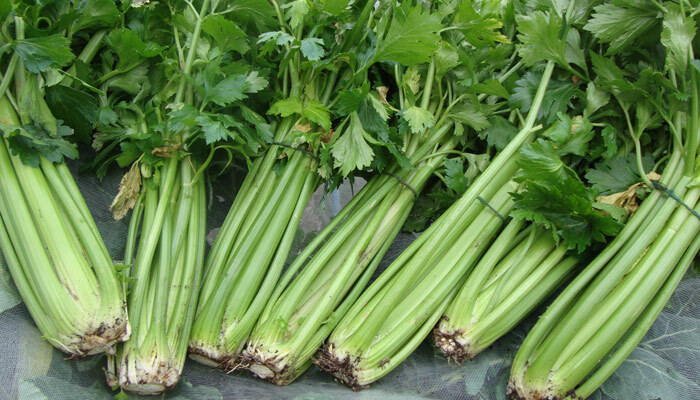 Celery extract has been shown to help treat rheumatism, and ease muscular pains. Perhaps one of the most loved childhood snacks in America is ‘ants on a log’ – celery with peanut butter and raisins. Keep this tradition alive by eating celery for a snack, but with hummus instead. Add celery to tuna and chicken salad for an increased depth of flavor, or to your favorite stir-fry recipe. What is your favorite way to eat celery? Please comment and let me know!